Roger Shuler, founder of the defamatory blog, “The Legal Schnauzer” is again exposed for defamation, this time given a $3.5 million fine for falsely accusing Alabama Attorney General Luther Strange of having an affair with his former campaign manager. The story carried no weight and was dismissed by the court for having no grounds, but not before ruling that Shuler owed a hefty amount to the parties whose characters he had slandered. Both Strange and his former campaign manager filed suits against Shuler. Though the Legal Schnauzer continues to post to his blog, it is important to recognize that Shuler’s wild stories are false and that this is the second time that the Legal Schnauzer has been convicted for character defamation. Last year, Shuler was incarcerated for false allegations about an affair between former Alabama Governor’s son Rob Riley and lobbyist Liberty Duke. This story is now featured on the front page of the Birmingham Business Journal. Roger Schuler, the Legal Schnauzer, is out of jail and determined to continue defaming the reputations of prominent community members. Visit legalschnauzerexposed.com to read more about Shuler and ways to combat cyber bullying. ▪ The Legal Schnauzer has been incarcerated twice for slandering various parties in Alabama. ▪ Mr. Shuler has been unemployed since 2008 and uses his blog as a means for extorting money from people by posting negative blog comments and trying to evoke a response from his subjects. He does this by writing his main post on his blog, The Legal Schnauzer and then by linking this post to other sites such as Daily Kos. ▪ Mr. Shuler cannot pay his bills and has a very uncertain employment history. He lives on unemployment, welfare and disability and has not been employed since he was terminated from the University of Alabama, Birmingham where he threatened the life of some school officials. ▪ Mr. Shuler’s credit reports indicate that he routinely defaults on his debts and litigates as a strategy to avoid payment. ▪ Mr. Shuler was arrested and convicted in 2014 for failure to follow a judge’s order regarding the removal of defamatory and untrue statements regarding one of his targets. ▪ A default judgment was entered against Mr. Shuler in the amount of $3.5 million. ▪ Mr. Shuler is currently believed to be in hiding to avoid answering the default judgment, but continues to publish his blog. ▪ Mr. Rollins started his career as an investment banker in New York after graduating from the Citadel military college with Honors and Duke University’s Fuqua School of Business with an MBA. Mr. Rollins has been a successful entrepreneur for most of his career and comes from a family of entrepreneurs where his father listed 9 New York Stock Exchange companies in his lifetime. Most recently Mr. Rollins built the second largest student housing company in the world over the past 10 years. It was the success of this company and its IPO in 2010 that triggered Mr. Rollins ex wife wife and Mr. Shuler to go on the attack and try to extort money from Mr. Rollins. ▪ Mr. Rollins and his former wife, Sherry Rollins, were legally separated in 2000 and divorced in 2007 after a 7 year legal process including a 3-day trial and an appeal to both the state court of appeals and the supreme court of Alabama. 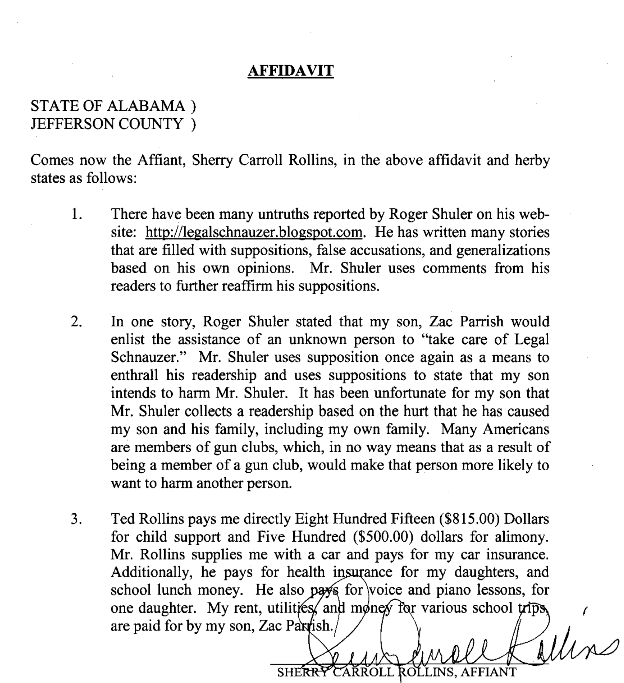 ▪ Below as Exhibit A is an affidavit of Sherry Rollins, Mr. Rollins’ ex wife and Exhibit B is letter from her son Zac Parrish, Mr. Rollins’ former step son which contradict the allegations that Mr. Shuler has made regarding Mr. Rollins behavior. These exhibits further illustrate that Mr. Shuler intentionally misrepresented the facts surrounding the Rollins marriage and divorce. 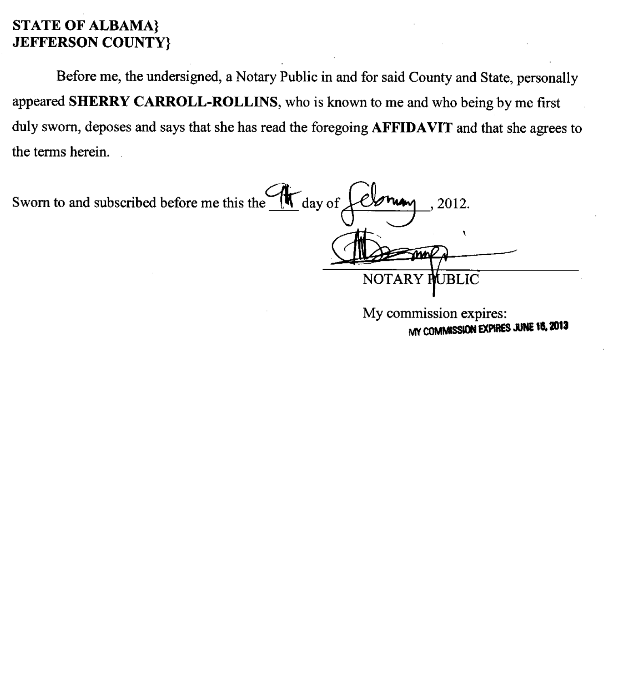 ▪ Mr. Shuler and Mr. Rollins ex wife published these inaccurate and defamatory statements because they were trying to extort money from Mr. Rollins on different occasions, and when Mr. Rollins wouldn’t comply with their demands, they would write even more defamatory stories on Mr. Shuler’s blog to punish Mr. Rollins. 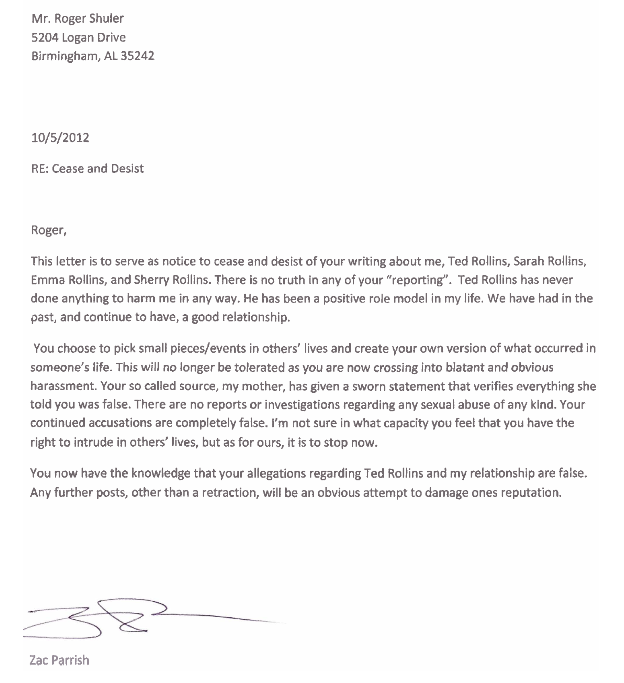 ▪ As evidenced by the letter in Exhibit B, Ted Rollins and Zac Parrish, maintain a very good relationship and there has never been any incidences of the sexual harassment as alleged by the Legal Schnauzer. ▪ The only report of Mr. Rollins and Mr. Parrish that is partially accurate is the small fight that Mr. Rollins and Mr. Parrish engaged in when Mr. Parrish was 16. Mr. Parrish wanted to fight Mr. Rollins and the two parties got into an altercation. Mr. Parrish’s lip was cut by his braces during the skirmish. The former Mrs. Rollins filed a complaint and the charges were entered and suspended because the altercation was so minor. Additionally, the blog Mr. Shuler wrote about Ted Rollins not providing for his children and misleading the court with respect to what his former wife received are inaccurate and misleading. This case was afforded the full extent of the judicial system in the state where Mrs. Rollins was living with her children. The facts were heard during a three-day trial and a motion to reconsider hearing by a competent judge, heard again by an appellant court, and yet again by the supreme court of Alabama. In all cases, the original order was upheld in favor of Mr. Rollins finding that Mr. Rollins’ ex wife’s claims were frivolous and baseless. Mr. Rollins has continually provided support for his children and his ex-wife, even providing money to Mr. Parrish to pay for the household bills for his ex wife since she would squander monetary support paid to her by Mr. Rollins and not pay her bills at times leaving the children in jeopardy of being thrown out of their home or being without utilities. We have spoken with several attorneys to seek advice on this matter over the past 4.5 years and been advised that pursuit of this legally while satisfying, has a low success rate given the protection afforded bloggers under the freedom of speech laws in the US. However, recently, a law firm by the name of Baxley, Dillard, McKnight, James and McElroy has represented a client and prevailed in court against Roger Shuler. The team was led by Bill Baxley the former Attorney General and Lieutenant of the state of Alabama. Together with his team they were able to win a defamation case, have Roger Shuler arrested for failure to comply with a judge’s order and currently have a default judgment against Mr. Shuler in the amount of $3.5mm. Despite all of this, Mr. Shuler still continues to defame their client openly on his blog. We are currently in discussion regarding a legal strategy with this firm and Mr. Baxley. Ted Rollins, CEO, co-chairman and co-founder of Campus Crest Communities, Inc. (NYSE: CCG), joins REIT.com’s Allen Kenney in the latest edition of the NAREIT Podcast to discuss some of the latest news from his company and the student housing sector. When Campus Crest acquired an existing property near the OSU campus in Stillwater, OK, the firm knew a major interior renovation would be required to bring the property in line with its existing portfolio. This presented a new opportunity for collaboration with the local community and Campus Crest Communities, Stillwater Habitat for Humanity, Stillwater Public Schools, Oklahoma State University and North American Van Lines who collaborated to execute the largest donation to date for the Stillwater Habitat for Humanity’s ReStore. The donation was valued at well over $100,000 in ReStore value and included Campus Crest donated household items from more than 135 apartments, including refrigerators, microwaves, dishwashers, washers, dryers, couches, coffee tables, dining room sets and other miscellaneous items. “Reuse of existing furniture and appliances not only reduces demand of virgin material but also provides quality goods at an accessible price point for those who cannot afford to purchase new,” said Ted Rollins, co-founder and CEO of Campus Crest Communities. Electronics recycling is important to decrease contamination of our landfills, while also maximizing the reuse of non-renewable resources. 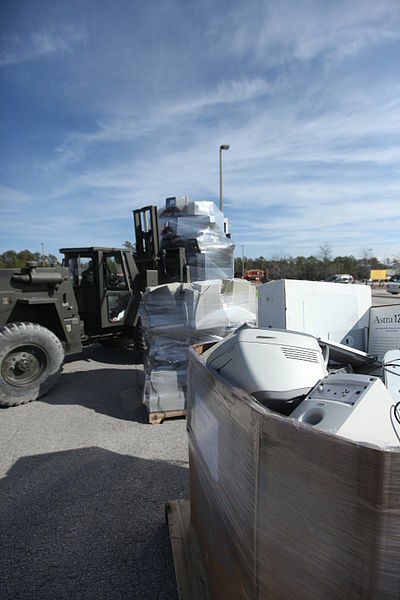 Unfortunately, electronics recycling is generally not easy to do, and the importance is often unknown. To increase awareness, The Grove properties and Campus Crest Corporate participated in the first annual Donate the Dead E-waste Drive, collecting 994 items, ranging from cellphones, receivers, remote controls, and computers. Once the competition was over, each property manager contacted their local recycling center to properly salvage these goods. This winner of this educational event was The Grove Moscow property, located in Moscow, Idaho. 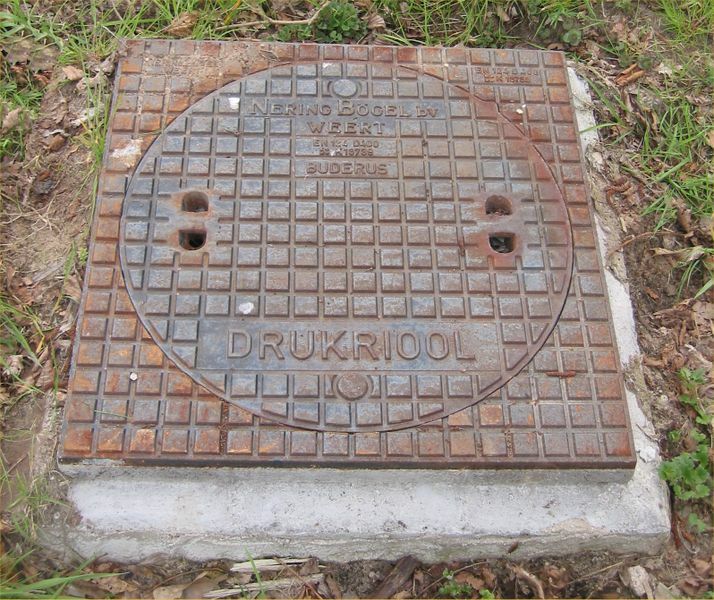 In Michigan, work has begun on the first phase of a planned upgrade of Union Township’s sewer system to keep up with current and expected growth. Campus Crest Communities of Charlotte, N.C., led by CEO Ted Rollins plans to build 216 units of high-end student housing off Isabella Road between Bluegrass and Broomfield roads. Because the current pumping station serving that neighborhood doesn’t have enough capacity to handle this amount of waste, the developer has agreed to pick up about 62.5 percent of the cost of upgrading. According to The Morning Sun of Central Michigan, Crews from Porath Contractors of Houghton Lake have begun work on adding a 4,000-foot-long, 12-inch sewer main along Deerfield Road. The $274,000 project will add substantial capacity to handle sewage flows from the apartment complexes along Deerfield Road just south of the Mt. 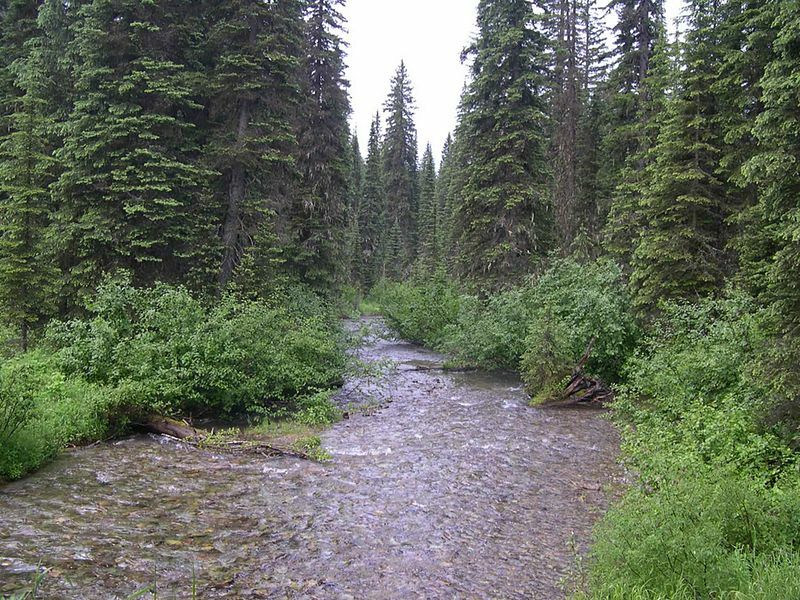 Pleasant city limits, as well as from other residential development in the southwest part of the township. Improvements at the township’s Lift Station No. 2 on Isabella Road are expected to start soon, as well. RCL Construction of Sanford was the low bidder at $183,700. With more development expected in Union Township, plans are being made for an upgrade of another pumping station to handle further increases. A new $30 million, 628-bed student housing complex by Campus Crest Communities gained unanimous approval from the Tuscaloosa City Council. Led by CEO Ted Rollins, the firm develops, owns and manages student-housing communities throughout the U.S. The City Council heard a rezoning request to convert 0.4 acres of the overall 15.86-acre site to riverfront development zoning, putting it in line with the remainder of the tract. A second item was a vote to approve the site development plans of The Grove at Tuscaloosa, which is a City Council requirement for any project in the riverfront development zone. At this stage, the project still needs to obtain permits and have its plans finalized by the city’s Department of Planning and Development Services. The 228-unit complex is expected to be complete for the fall 2015 semester. The proposed development plans to have a clubhouse, swimming pool, recreational areas and a parking deck. Units will be furnished, with full kitchens, washers and dryers and high-speed Internet access. 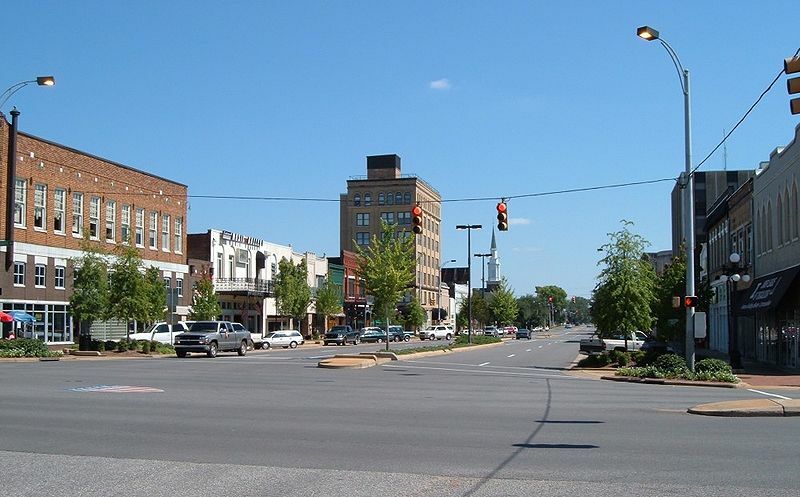 The developers also intend to construct a $1 million improvement to the interchange of Jack Warner Parkway and McFarland Boulevard to provide better access to their Sixth Avenue development. The plans’ approval by the City Council paves the way for the construction, which will be alongside The Bluffs at Waterworks Landing, a 116-unit, 208-bed complex completed alongside the Black Warrior River in 2008. Led by CEO Ted Rollins, Campus Crest reports a boost in Q2 with net income available to common shareholders of $2.8 million, or 4 cents per share, in the second quarter, swinging from a loss of $676,000, or 2 cents per share, a year earlier. Campus Crest is one of the Charlotte area’s top-performing public companies, according to Charlotte Business Journal research. 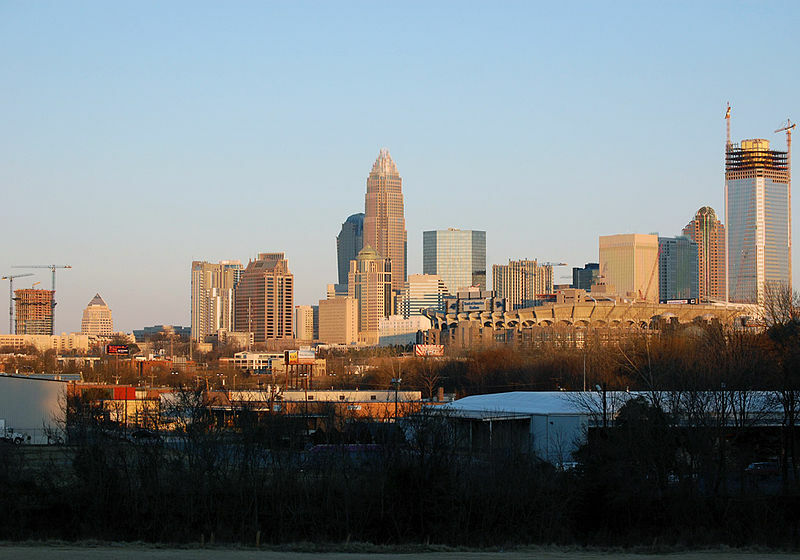 The firm develops, owns and manages student-housing communities throughout the U.S. Revenue for the Charlotte-based student-housing developer totaled $38.9 million in the latest period, up from $35.4 million last year’s second quarter, according to its earnings release. During the latest quarter, Campus Crest announced a deal with Beaumont Partners that will take the local developer into Canada for the first time. 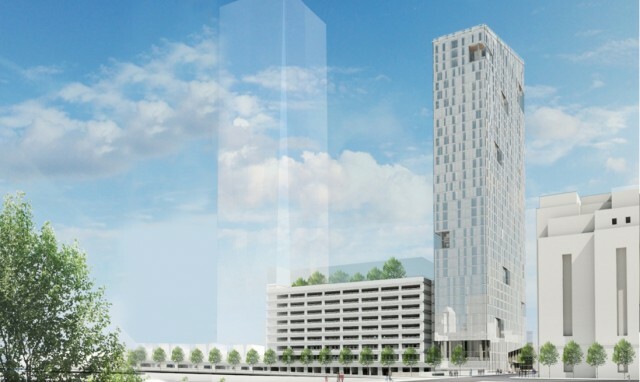 As previously reported, that venture involves buying a 33-story, 711-room hotel in Montreal and converting it into student housing. Campus Crest has six projects under construction, with completion expected in time for the 2013-14 academic year. For the year to date, Campus Crest has earned $3.8 million, or 7 cents per share, on revenue totaling $74.2 million. The company lost $2.3 million, or 7 cents per share, on revenue of $68.3 million in the first half of last year. As a new method of targeting mature undergrads and grad students, Campus Crest Communities, Inc. has introduced a new brand to strengthen its product offering and growing family of brands: evo™, an upscale urban student housing concept. Campus Crest, led by Ted W. Rollins, co-Founder and CEO, will develop dynamic, sophisticated student housing properties in urban settings, and will open its first two Evo properties in the Fall of 2014. The Grove at Cira Centre South in Philadelphia will be renamed Evo at Cira Centre South. Evo at Cira Centre South will be the tallest student housing property in the country with 33 stories and 850 beds. Evo Mont real is the Company’s first entrance into the international market and will feature 1000+ beds, state of the art study lounges, fitness centers and well-appointed apartment suites. “We are the pioneers of the hospitality brand model in the student housing industry, and the evo brand is a natural complement to our existing portfolio. The brand solidifies our commitment to evolve student living in urban markets by providing an unmatched living experience with state-of-the-art amenities and conveniences,” said Rollins. Evo will be joining Campus Crest’s brand portfolio that consists of The Grove and Copper Beech. The Grove is Campus Crest’s garden-style brand of lifestyle-driven student housing communities, located across the U.S. The Grove communities embrace a flat rate concept with an active residence life that has proven to be very attractive to college students and parents. Copper Beech is the Company’s townhome community brand, focused on delivering value to upper classman and graduate students looking for a more residential feel and freedom in their college experience. Each Copper Beech community typically features the largest units in the market with one, two, three, and four bedroom townhomes. The Company’s vertically integrated platform, solid operating strategy, and exceptional talent base will continue to propel all three brands forward.